Dimensions 0 by 5.43 by 8.50 in. In an age of internet scrolling and skimming, where concentration and attention are fast becoming endangered skills, it is timely to think about the act of reading and the many forms that it can take. Slow Philosophy: Reading Against the Institution makes the case for thinking about reading in philosophical terms. Boulous Walker argues that philosophy involves the patient work of thought; in this it resembles the work of art, which invites and implores us to take our time and to engage with the world. At its best, philosophy teaches us to read slowly; in fact, philosophy is the art of reading slowly â and this inevitably clashes with many of our current institutional practices and demands. Slow reading shares something in common with contemporary social movements, such as that devoted to slow food; it offers us ways to engage the complexity of the world. 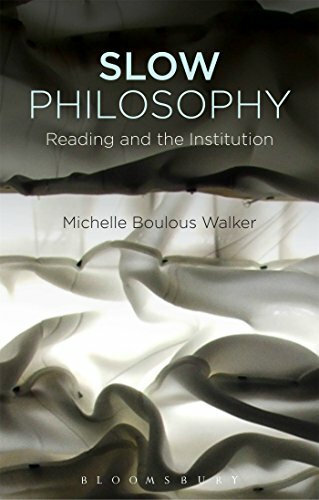 With the help of writers as diverse as Nietzsche, Wittgenstein, Woolf, Adorno, Levinas, Critchley, Beauvoir, Le DÅuff, Irigaray, Cixous, Weil, and others, Boulous Walker offers a foundational text in the emerging field of slow philosophy, one that explores the importance of unhurried time in establishing our institutional encounters with complex and demanding works. About: In an age of internet scrolling and skimming, where concentration and attention are fast becoming endangered skills, it is timely to think about the act of reading and the many forms that it can take.